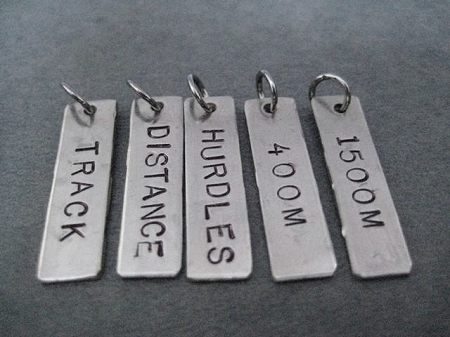 Choose your Distance or Event! Choose either the 100m, 200m, 400m, 800m, 1500m, 1600m, 3000m, 3200m, 5000m, 10,000m, SPRINTS, RELAY, HURDLES, DISTANCE, POLE VAULT, THROWS, JUMPS or STEEPLE. 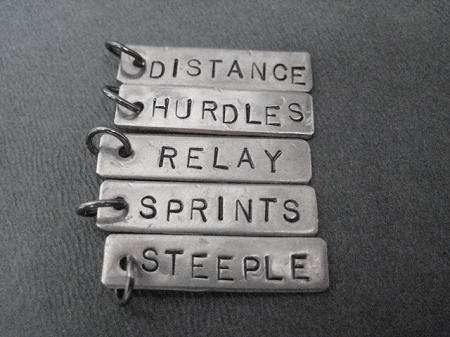 Nickel Silver Rectangle Charm is hand hammered and hand stamped, measures 1/4 x 1 inch and includes a gunmetal jump ring. If purchased without another item from The Run Home at the same time, your CHARM will arrive to you tucked inside a small organza bag then placed inside a manila bubble mailer for safe shipping.